Akin to Márquez’s Macondo or Faulkner’s Yoknapatawpha County, Velázquez’s PopSTock! is a fictional territory in a familiar but strange northern Mexico. 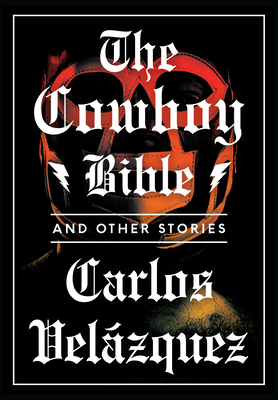 Throughout the stories is woven the Cowboy Bible—a mystical and protean object that first appears as the talisman of a Santería-practicing luchador, DJ, and art critic, then later morphs into an unbeatable marathon drinker, a scion of a fried-chicken vendor dynasty who becomes a Communist guerilla freedom fighter, and the leather for a pair of boots so coveted that it leads a man to grant the devil a night with his wife. With such otherworldly scenarios, pop-culture panache, and Velázquez’s linguistic inventiveness, The Cowboy Bible is a brazen commentary on modern Mexican reality. Born in Coahuila, Mexico in 1978, Carlos Velázquez is the author of story collections Cuco Sánchez blues (2004), La biblia vaquera (named one of the books of the year by Reforma in 2009), and La marrana negra de la literatura rosa (2010). He received the Premio Nacional de Cuento Magdalena Mondragón and has been anthologized in el Fondo de Cultura Económica’s Anuario de poesia mexicana 2007. Born in Havana, Cuba, Achy Obejas has written fiction, poetry, and journalism. She is the author of five books, including three novels: Days of Awe, Memory Mambo, and Ruins. Her poetry chapbook, This is What Happened in Our Other Life, was both a critical favorite and a bestseller. She is trained as a journalist and has worked in the alternative press, including In These Times, where she writes a monthly column, and The Chicago Tribune. A translator between Spanish and English, she translated into Spanish Junot Díaz’s The Brief Wondrous Life of Oscar Wao and This is How You Lose Her and into English such contemporary Latin American writers as Rita Indiana, F. G. Haghenbeck ,and Wendy Guerra. She is the recipient of a USA Ford Fellowship, a Woodrow Wilson Visiting Fellowship, a team Pulitzer Prize for the series “Gateway to Gridlock” while at the Tribune, a National Endowment for the Arts Fellowship in poetry, the Studs Terkel Journalism Award, and a Cintas Foundation Fellowship. She is currently the Distinguished Visiting Writer at Mills College in Oakland, California. “All of the stories are distinct but share similarities in tone and structure: layers of pop culture references, quoted verses and song lyrics, and references to events mentioned in other portions of the book. In her translation, Obejas superbly amplifies Velázquez's style. Playful and clever, inventive but familiar, this brief book is deeply satisfying, and warrants multiple readings." "?The Cowboy Bible will challenge readers to push beyond cultural stereotypes and rethink everything they know about northern Mexico and their homes."